Ordering fries from a new restaurant, bar, cafe, and so on, is always a gamble. You never know how the fries will turn out – they could be cooked just right or simply disgusting. Same goes for men, if I may compare. You meet a guy and he seems decent enough, but he could very well turn out to be a soul-sucking, controlling man-whore for all you know! I read somewhere recently that ‘most relationships are doomed to fail even before they start’, and looking back at my previous relationships, I couldn’t agree more. That’s why I think it’s important to know what you’re getting into, before you get into it. Here are four simple steps to help you figure out what you’re getting into when it comes to fries and men. The first impression always counts, and so this has to do with the first time you lay eyes on those fries. Are they golden-brown? Are they sliced into thin pieces? Just from seeing what they look like, you could already begin to imagine how they would taste. And believe it or not, you really can learn a thing or two about a guy just from that first glance. For instance, you can tell if he’s genuine from the way he smiles. Or whether he’s confident or demure from his posture. Pay attention to these cues as they will be useful when you get to the next steps. The best advice I’ve ever gotten in my life is “Trust your senses”. Why? Because sense is one of the most valuable gifts given to us, and it works wonders when we know how to use it. With your fries, use your sense of smell to guide you. 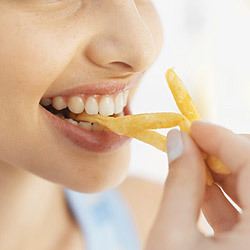 The aroma of your fries can tell you what type of oil has been used, or whether they have been overcooked. With your men, this is where you really use your sense – your intuition – your instincts. It’s a bit tricky because sometimes your sense is trying to tell you something, but it gets buried underneath all your other thoughts, and you end up disregarding it. But to make it a little easier to locate, your sense is that nagging feeling you have sometimes, or that little voice in your head. And it could come in any shape or form – there are people who told me they actually hear their grandmother’s voice. Learn to get in touch with your senses, and more importantly, listen to them. After so many years of ignoring what my senses were telling me, I came out wishing I had listened to them. Would have saved me a lot of trouble. So now I live by this very simple policy of ‘if it doesn’t feel right, something’s wrong’. And because of this, I am able to see warning signs and get out BEFORE getting into ‘questionable’ relationships. The next step is to feel, or get a ‘feel’ for your fries & men. For fries, it’s as simple as touching. You can feel if they’re soft or crispy, greasy or dry, hot or cold – all of this by touching. For men, to get a feel for them, you would actually need to talk to them. And just like the first glance, your first conversation is equally important. This could be the first of many conversations to come, or depending on how it goes – the very first & last conversation you’ll have with this guy. This is where you can learn a lot about a guy, not just from what he says, but also by reading between the lines. For example, are there certain topics he’s tactfully trying to avoid? Is he over-selling himself? Does he take himself too seriously? And of course, talking is two-way, so here’s your chance to talk a bit about yourself and see how he reacts to it. If you’re a family person, talk about your family so you can see where he stands when it comes to the subject. Ask the right questions, and watch for signs or patterns. I can’t tell you how many times I knew a guy wasn’t right for me just from that first conversation. And here it is, the final step in knowing what you’re getting into. It’s pretty straightforward with fries : You pick up a piece of fry, take a small bite, and you would pretty much know exactly how the rest of it will taste like. Unfortunately it’s not that black & white with men. That’s why it’s important to date, as it gives you a taste of what the guy is like. I’m sure all of you would agree that the dating process is painful, but trust me, it’s less painful than getting into a relationship prematurely. So use the whole dating experience to your advantage. Let it help you figure out what you’re really getting into, and whether or not you wanna get into it. A little tip to save you some time, and there’s a recurring theme with ‘firsts’ here. That’s right : First dates! This is where you will get to see a live preview of how this guy is going to behave, should you get into a relationship with him. Does he order for you, or does he let you order for him? Does he say ‘Thank you’ to the waitress? Does he offer to pay the bill? Does he ask you how your food is? These are just to name a few, but there are many more things you can pick up on the first date that will help you make a decision. I remember one horrifying first date where the guy showed up 40 minutes late without apologizing, ordered a drink just for himself, ate half of my food, didn’t laugh at my jokes, didn’t ask if I want dessert, didn’t offer to pay the bill, and didn’t walk me to the taxi stand. Needless to say, there was no second date. So, my advice : Date, date, and date! Date until you’re sure that you want to get into something more serious with him. Now that you’ve gone through the above steps, you’ll hopefully have a clearer idea of what you’re getting into and be in a position to make an informed decision. Of course, there’s never a guarantee of how things will turn out. It’s always going to be a gamble – getting into relationships. But if you at least know what you’re getting yourself into, you’ll be able to better cope with it. Good luck to all! oh so true! and it would seem that a great man is about as easy to find as a great bowl of fries..
I’m so glad you commented on my blog– because then I was able to find yours! 🙂 Awesome concept. I’m hooked! Love this post and can’t wait to see more.